This will be my last blog referencing Cookies Across America - only for the fact it completes my cookie baking for the military. Of all the branches that I delivered cookies to, the Navy proved to be the most illusive lol - I must have driven by the same office three times, each time it was closed too! 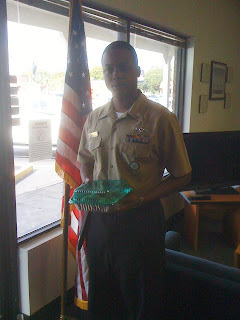 I finally drove 14 miles across Tampa Bay and found another Navy Recruiting office to give my cookies to! I know that there are still a few more days left where I could do more baking, but I think I'm about cookied out lol :) In the meantime if you've never "baked a difference" -if you're reading this perhaps the last few blogs will be a motivating factor for you to get involved next year and bake cookies to give away to those who make a daily difference in the city where you live.